Modern medical imaging and radiation therapy technologies are so complex and computer driven that it is difficult for physicians and technologists to know exactly what is happening at the point-of-care. Medical physicists responsible for filling this gap in knowledge must stay abreast of the latest advances at the intersection of medical imaging and radiation therapy. 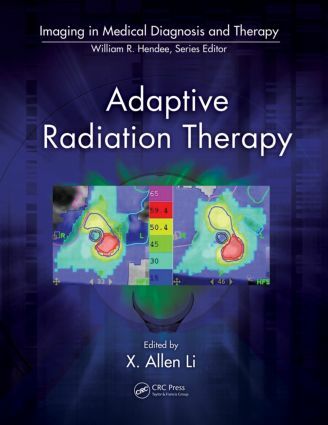 This book provides medical physicists and radiation oncologists current and relevant information on Adaptive Radiation Therapy (ART), a state-of-the-art approach that uses a feedback process to account for patient-specific anatomic and/or biological changes, thus delivering highly individualized radiation therapy for cancer patients. The book should also benefit medical dosimetrists and radiation therapists. The technology and methodology for ART have advanced significantly in the last few years and accumulated clinical data have demonstrated the need for ART in clinical settings, assisted by the wide application of intensity modulated radiation therapy (IMRT) and image-guided radiation therapy (IGRT). This book shows the real potential for supplying every patient with individualized radiation therapy that is maximally accurate and precise. The authors have succeeded in creating a single compendium which covers nearly every aspect of this complex subject. There is a great need for such a book given the scope and variety of techniques involved, and the lack of any clear consensus on how to implement adaptive therapy regimes. … It is well laid out, with lots of diagrams, worked examples and case studies as well as referencing all the key documents on the subject. … an excellent one-stop resource for any centre considering implementing adaptive radiotherapy techniques. The breadth of the book is impressive, and the authors of each chapter provide a wealth of up-to-date references making it easy for readers who are interested in exploring certain ART techniques and technologies in more detail … The editor and the authors are to be commended for producing a valuable work on a very dynamic field that offers a chance for meaningful clinical benefits to many patients receiving radiation therapy for a variety of cancer types and clinical indications. The editor and authors are to be commended for putting together this excellent book describing the rationale, technologies, implementation, and future research for adaptive radiation therapy (ART). This topic is very timely as ART is the most logical approach to personalized medicine for cancer patients requiring radiation therapy as a single or combined modality treatment. The book contains a wealth of useful information ranging from practical workflow issues to directions of future research. I recommend this book for medical physicists and radiation oncologists who are interested in clinical practice and research utilizing advanced imaging and radiation therapy technology. Dr. Li and his colleagues are to be commended for assembling within a single volume a compendium of recent vast technological progress that advances us towards this paramount goal [of individualized radiation therapy].